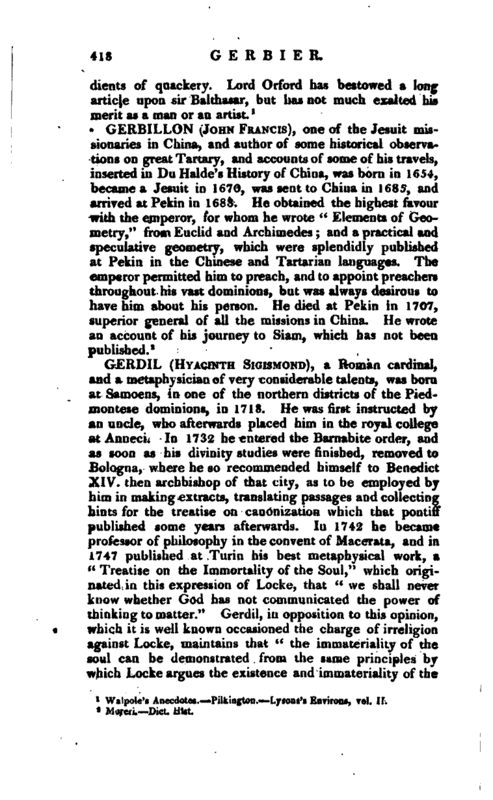 , a Roman cardinal, and a metaphysician of very considerable talents, was born at Samoens, in one of the northern districts of the Piedmontese dominions, in 1718. He was first instructed by an uncle, who afterwards placed him in the royal college at Anneci. In 1732 he entered the Barnabite order, and as soon as his divinity studies were finished, removed to Bologna, where he so recommeuded himself to Benedict XIV. 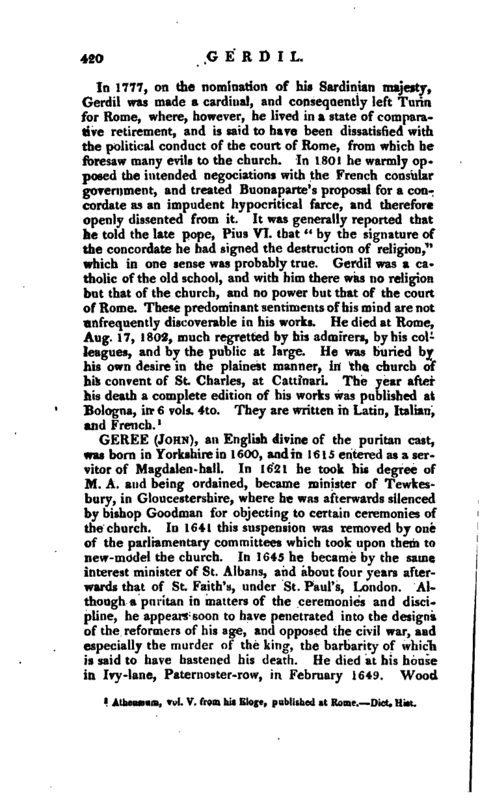 then archbishop of that city, as to be employed by him in making extracts, translating passages and collecting hints for the treatise on canonization which that pontiff published some years afterwards. 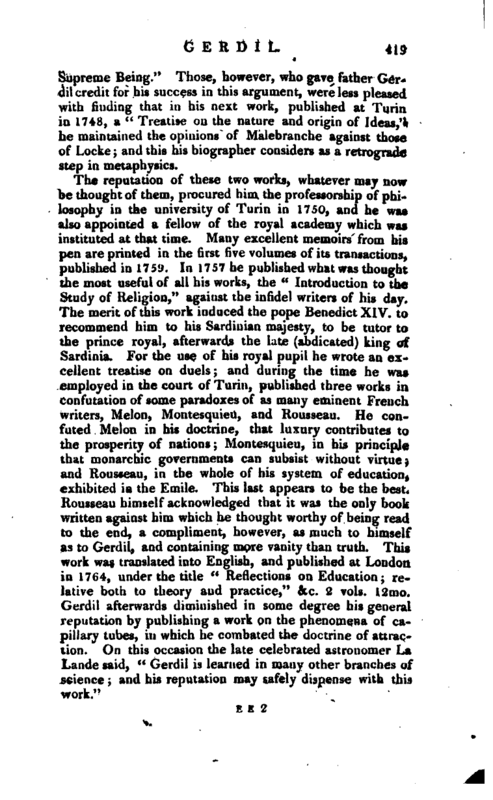 In 1742 he became professor of philosophy in the convent of Macerata, and in 1747 published at Turin his best metaphysical work, a “Treatise on the Immortality of the Soul,” which originated in this expression of Locke, that “we shall never know whether God has not communicated the power of thinking to matter.” Gerdil, in opposition to this opinion, which it is well known occasioned the charge of irreligion against Locke, maintains that “the immateriality of the soul can be demonstrated from the same principles by which Locke argues the existence and immateriality of the | Supreme Being.” Those, however, who gave father Gerdil credit for his success in this argument, were less pleased with finding that in his next work, published at Turin in 1748, a “Treatise on the nature and origin of Ideas,” he maintained the opinions of Malebranche against those of Locke; and this his biographer considers as a retrograde step in metaphysics. 1 Athenaeum, vol. V. from his Eloge, published at Rone. —Dict. Hist.